September 18, 2018 September 18, 2018 - by Paul Farol - 10 Comments. I am not sure if CamSur Second District Representative Lray Villafuerte had tears in his eyes as he was plaintively crying that he was bullied during plenary debates on the proposed 2019 budget. But if he had torrents of snot running down his fat face, I wouldn’t be surprised. An observer at the plenary hall of the House of Representatives told me that he wasn’t really upset over the talk he had with fellow Bicolano and First District Representative Nonoy Andaya Jr.. But, rather, Lray was incensed over the discovery of his P1 Billion “hidden” pork barrel and Speaker Gloria Macapagal Arroyo’s decision to distribute this more equitably. After all, what good would it do to give Lray (granting it were actually LEGAL) control over P 1 billion in “pork” if decades of his clan’s rule in Camarines Sur has resulted in MORE poverty? I wonder how he deals with the thought of his starving province-mates? Perhaps the sands and sea of a luxurious Amanpulo resort is more than enough to wash away the sordid vision and stench of unwashed Bicolano masses begging his son, Gov. Migz Villafuerte to sell them NFA rice at P55 per kilo. 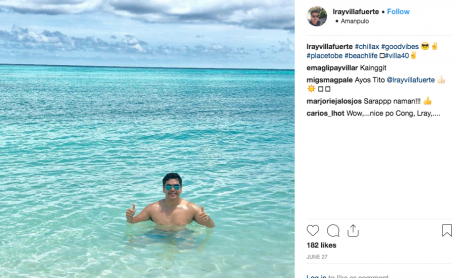 In a news report, it appears Lray — also known as a tourism congressman for his frequent and lavish trips outside his home province — attempted to lead 40 to 50 congressmen to oust Speaker Gloria Macapagal Arroyo and replace her with Marinduque lone district representative Lord Alan Velasco. A highly placed source said this is coming from the group that is insisting on keeping some P55 billion worth of projects in the 2019 budget. The source claimed Arroyo wanted the money distributed equitably to all congressmen. The source said Arroyo might be replaced with Marinduque Rep. Lord Alan Velasco but the proposal is not gaining traction now. Another source said the projects in question affect 40-50 congressmen and were prepared under the previous House Speakership. A source who claims to have seen a list said about P4.7 billion went to a congressman from North Luzon, P3 billion in projects for a congressman from the Visayas, and P1 billion for a Congressman from Bicol. Revealing how much of a pulpolitiko Lray is, is his insistence that he was bullied at the plenary session and turning the focus on himself, instead of the budget matters on hand. I guess that’s something to be expected from Lray, who, a couple of months ago claimed he was harassed by residents of Pili after he dumped tons of soil on the road leading to their farms and effectively deprived them of their land. If that hints at his Pinoy dysfunction, perhaps pointing out that congressman Lray is the RICHEST Bicolano congressman in the POOREST Bicol province will leave no doubt of the terminal sickness plagues Bicol Politics. The world of the elite is a world where corruption is just a natural thing to do. Replacing one elite leader with another elite leader will never solve the problem of corruption because it is their nature, it is the nature of the present world we live in, so everyone will be corrupt one way or another despite the moral values being constantly preach by the the church, values that exist only in hypocrisy. Who are the Elite? They are the last-remaining colonists. They own everything! They are the industrialists. They are not corrupt. Philippine Fake News found nothing about them being corrupt. Just ask Rappler. Rappler can only find corruption in brown-skin thick-lips English-speaking indigenous Filipinos. Colonists are good people. They are honest. The History books are wrong. They demonize the colonist. If Colonists were and to this day are wrong why is it there are no news about them thieving and corrupting? That is why COLONIAL MENTALITY is good. Because if colonists are non-thieving non-corrupting people, therefore, their colonial mentality is outstanding. Unfortunately, the colonists were not able to colonize the minds of Filipinos. We should ask Raisa and Rappler why? Oh, by the way, I asked Raisa and Rappler several times before they blocked me. Because they are just too embarrassed to answer they are afraid of the left-behind colonists. Pork Barrel is always the source of graft and corruption by our political leaders. Most grow rich with Pork Barrels, with their constituents, who are the true recipients of the Pork Barrel , remaining poor. Pony Aquino used Pork Barrel, as a “carrot and stick”, to encourage political leaders to impeach the late Supreme Court Chief Justice Corona. Aquino must be tried of Pork Barrel bribery. Ousting leaders, who remove their Pork Barrels, shows that these political leaders are indeed corrupt now to the core ! Pork Barrel is good. The only problem is if Pork Barrel is given to brown-skin English-speaking indigenous Filipinos they shove it in their behind … errrr ….. back pocket, I mean. See, in the Philippines if one see a brown-skin punk’d nose English-speaking Filipinos in huge shiny black SUVs they are likely stolen from fellow brown-skin punk’d nose English-speaking Filipinos. If anybody gives you lip about your conclusion. Just tell them that these political dynasties internally refer to running for office as “the family business”. Running a political office is pure business to brown skin Filipinos … running industries are for the mestizo class. Brown skin Filipinos running Philippine Fake News NEVER ATTACK THE MESTIZO CLASS but attacking their own brown skin Filipinos is just fair game. Attacking the left-behind colonist mestizo class by Philippine Fake News is TABOO, therefore, Philippines is still a colony of the Mestizo class. Have you noticed when a Filipino see a fellow Filipino driving a huge shiny gleaming black SUV they ask subconsciously, “wonder what he does whom he stole it from”. But when they see a left-behind mestizo class they never ask because Filipinos know they are the industrialists and Filipinos work for them. The only way Filipinos get rich is run for public office BECAUSE THAT IS WHERE THE MONEY IS. why not abolished pork barrel and let the executive handle all expenditures instead of letting those crocodile congressman handle everything? the government should battle these private enterprise to fight inflation or else we can see now how they put down the administration through roxas proposals lately. It’s a second motion to bam’s cancelling of excise tax. it’s the same outcome put down the current administration. … to get rid of inflation the government should be self reliance through agriculture on every region at the same time providing employments to more pilipinos. poultry, meat, grains, vegetables, etc, controlled by the goverment instead of private enterprise, is a must to fight inflation. it might take a while but it will succeed for sure. Congress is like a baby. An alimentary canal with a big appetite at one end and no sense of responsibility at the other.